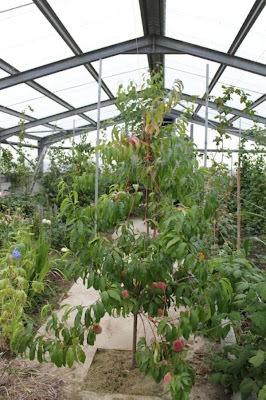 The Transalpine Redemptorists have posted an update on Our Lady's Garden showing photos of the massive greenhouse at various stages of preparation. Although they are still experimenting, they have, since March, been able to produce their own flowers for the altar. The Kiwifruit vine was unsuccessful and, after three years, they are asking "why cumbereth it the ground?" (Lk 13.7) By way of contrast, the grapes have grown, and they have had a crop of juicy peaches, leading them to ask whether theirs are the most northerly peaches in the world.